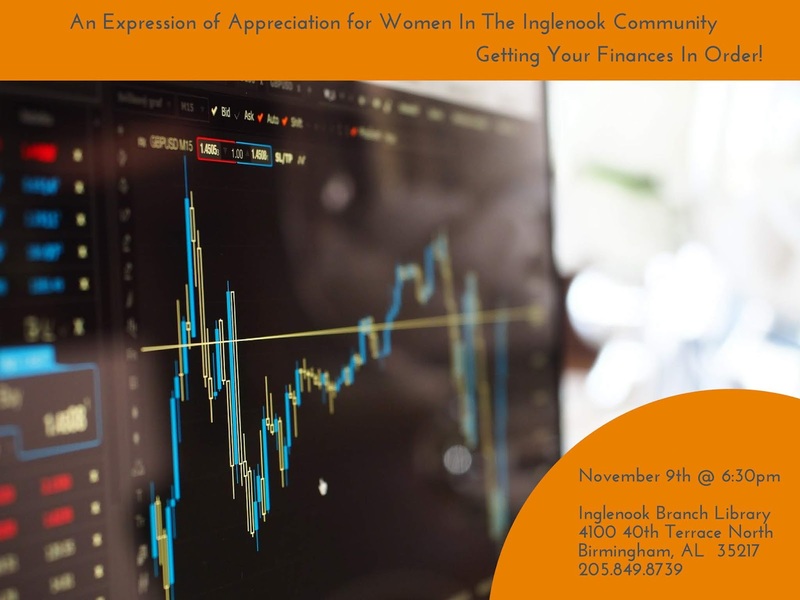 What: An Expression of Appreciation for Women of the Inglenook Community – "Getting Your Finances in Order"
When: Friday, November 9, 6:30 p.m. Details: This program will feature a financial adviser from the Birmingham Urban League sharing personal finance tips on maintaining a budget for the upcoming holidays. Free but registration required. An Expression of Appreciation for Women of the Inglenook Community, a bi-monthly program held at the Inglenook Branch Library, will shine the spotlight on the importance of wise spending habits as the Christmas holiday season approaches. The program, “Getting Your Finances in Order,” will take place on Friday, November 9, at 6:30 p.m. Though geared towards women in the Inglenook community, the public is invited to this program. A financial adviser from the Birmingham Urban League will speak about different aspects of financial recovery, along with creating and maintaining a budget for the upcoming holidays. To register or get more details, call Inglenook Library Branch Manager Karnecia Williams at 205-849-8739 or visit the library. Williams came up with the idea for the bi-monthly program nearly two years ago to give back to the community surrounding the Inglenook Library. Many families in Inglenook are led by single mothers, many of whom are unsung heroes who deserve recognition and support for their contributions to society, Williams said. Williams’ idea is a past recipient of a BPL Board of Trustees Innovative and Cool Award, which honors programs that go above and beyond service to library patrons.